CooperVision, one of the world's leading contact lens companies, is adding a new contact lens to its Biofinity brand. 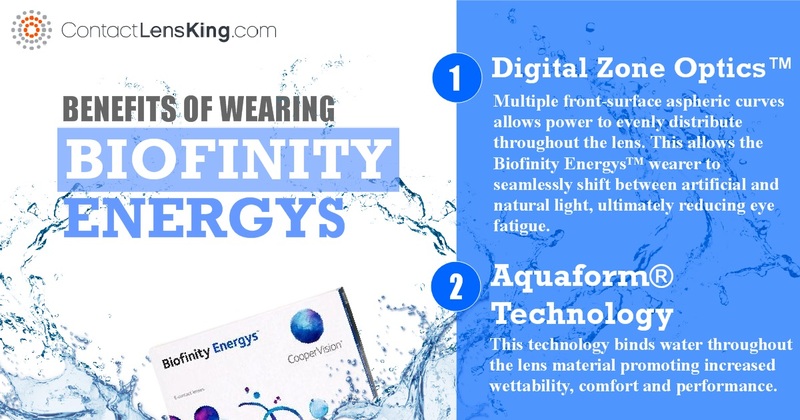 Biofinity Energys™ is offered as a monthly disposable in a 6 pack format made from comfilcon A, a polymer formulated to bind 48% water content. What's exciting about this lens is the technology that was used to produce it. According to Contact Lens King Inc., CooperVision utilized a new unique technology called Digital Zone Optics™ to manufacture this lens. This proprietary technology was developed with the goal of providing wearers who regularly use digital devices with a more optimal comfort experience. Along with the Digital Zone Optics™ technology implementation CooperVision has also developed and applied another proprietary technology called AquaForm® in an effort to ensure all day wearing comfort. Although all these talking points sound great what does it all mean for the wearer? How does these technologies work to provide the wearer with added benefits? Let's have a closer look at this new product and find out. First, lets take a closer look at CooperVision's Digital Zone Optics™. The goal of this technology was to allow Biofinity Energys™ wearers to seamlessly shift from electronic to non-electronic viewing. According to research conducted by Indiana University 75% of respondents who use electronic devices experience eye fatigue and dryness at least once per week. CooperVision's Digital Zone Optics™ tries to address this issue with the addition of multiple front-surface aspheric curves to distribute power evenly throughout the lens. This allows the Biofinity Energys™ wearer to seamlessly shift between artificial and natural light, ultimately reducing eye fatigue. But what about dryness of the eyes? How does the Biofinity Energys™ lens design mimize this? In an effort to address this issue, one that is often associated with all day digital interaction, CooperVision developed its Aquaform® technology. This technology binds water throughout the lens material promoting increased wettability, comfort and performance. According to CooperVision, the lens material itself has high oxygen transmissibility properties leading to increased oxygen breathabillity to the cornea therefore maintaining overall eye health. Unlike many other competitive lenses that may use artificial hydrating coatings and wetting agents Aquaform® Technology manufactured lenses use silicone macromers to naturally lock in water into the lens material therefore allowing the material to remain well hydrated for longer periods of time. With the introduction of this new technology CooperVision is able to reduce conjunctival interaction and irritation while increasing overall comfort. CooperVision's Biofinity Energys™ along with the new proprietary technologies used for its production is reported to be addressing an increasing volume of problematic eye health issues such as eye strain and general ocular discomfort caused by viewing digital devices for extended periods of time. This new lens successfully addresses the basic eye fatigue issue but, most importantly, it does so without compromising overall wearing comfort. "Symptoms associated with eye fatigue in soft contact lens wearers." Authors: D. Meyer, S. Huenink, M. Rickert, P. Chamberlain, and P. Kollbaum.Â Presented at the American Academy of Optometry Annual Meeting, October 2015, New Orleans, La., USA.